Sports clubs have a lot of data, from a wide range of sources. For the players themselves, there is physical data, about their condition, there is medical information, and there is performance data — e.g. goals scored or saved, time on the pitch. Clubs also have plenty of data about the other aspects of running a team, such as ticket prices, sales, season ticket patterns and so on. Utilising data isn’t new for clubs. Performance analysis has been around for many years now, where teams film matches and analyse footage through live or post-match ‘tagging’; marking a variety of key activities that are occurring in a match. Alongside this, it is common place for teams to use GPS-based systems to analyse players’ movements around the pitch, often termed physical data. However, these two sources are often looked at separately to performance data and by different individuals in the club. Is this different to the two sources of data referred to earlier in the paragraph? If so probably need to make this clear/explain what ‘performance data’ is. The issue for many clubs is that they are not able to pull together data from all these sources and silos to get a ‘whole club’ picture of the player. This means that they cannot fully take advantage of all the information available to make links between departments and sections, and maximise value – the players’ time on the pitch. This is where analytics comes in, and particularly the use of an analytics platform to unify the data in one place. Sports teams and clubs that have started to use analytics platforms have successfully created a ‘whole team’ picture. They are using analytics to improve team performance by reducing injury risk, analysing and managing training, and predicting performance. They are also finding that it is possible to increase revenues by improved ticket pricing taking into account demand, and to retain season ticket holders by better churn analysis, as well as improving marketing and merchandising. This has a considerable effect on the bottom line. It is possible to increase revenues by improved ticket pricing taking into account demand, and to retain season ticket holders by better churn analysis, as well as improving marketing and merchandising. Taking just one example of physical monitoring, analytics can help reduce injuries by managing training load better. Monitoring the training load for each player means that coaches know how each player or athlete is responding to training, and whether to rest them, increase training, or stay at the same level. This means that each player receives exactly the right amount and type of training to get them into the required condition for competitions. This can be done in real-time, using a laptop on the field working from pre-defined boundaries or by altering the training they receive the following day, using pre-defined ‘norms’ for each player determining how long they would need to train. This allows them to be in optimal physical condition for competition. At the same time, it reduces the risk of injury, meaning that players spend more time on the pitch — essential given the investment that many clubs have made in their top players. SciSports, a professional sports analytics company, provides solutions to clubs to enable them to analyse player performance one step further than traditional performance analysis. Traditionally, football data has focused on the player with the ball, but with SciSports the approach goes much wider and to a far greater level of detail by looking at every player on the pitch at the same time. This enables clubs to determine a players’ distance from other team members, the ball and what they do in terms of skill on the ball. This provides insight into a players’ positional play, formational discipline and how good they are at predicting the next move. A massive advantage of this is the ability it gives clubs to scout undervalued players who fit their style of play and may have previously slipped through the ne. SciSports’ approach means that coaches are more likely to find and benefit from these players. 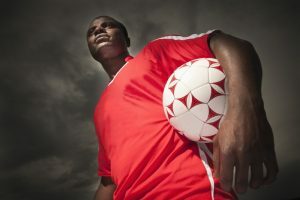 Improving player performance and keeping players injury-free are essential for any sports club, but engaging effectively with fans is also crucial. A key example is getting ticket pricing right to ensure the stadium is full for each match, so fans are not priced out of the market in favour of corporate entertainment. Analytics can also be used to improve variable pricing, and ensure that prices are appropriate for the different types of demand and/or level of the game. More effective fan engagement is possible with analytics, by sending them statistics and vouchers direct to mobile devices. Examples include image recognition to determine when a fan is becoming emotional with a game, triggering a voucher to their phone, to enhance their experience. It is also possible to use push notifications to direct fans to quieter ticket kiosks, gates or concession stands. Finally, analytics offers a way to identify season ticket holders at risk of not renewing, particularly through their social media activity. This can make it easier to work out how to engage with them again and reduce churn. Orlando Magic, a professional basketball team in the US with a small market compared to other NBA franchises, identified and successfully used analytics to increase their ticket revenue by 75% over three years. The team has combined data from all their own sources as well as the secondary ticket market to build a clearer picture of ticket sales and pricing. By using historical purchase data and renewal patterns, they can classify subscribers into one of three groups, and focus their attention on those who are undecided about renewal. Orlando Magic, a professional basketball team in the US with a small market compared to other NBA franchises, identified and successfully used analytics to increase their ticket revenue by 75% over three years. The bottom line about analytics for sports clubs is, fundamentally, that it can improve the bottom line. Analytics can give a strong competitive advantage, and in an area like sports where the smallest margin dictate success and failure, that matters.